“There are no hospitals here,” Khayr Mohammad, a refugee living with his family in a tent in east Kabul, told DW. They fled from the Taliban in Baghlan province, located north of the capital. “We have to travel long distances to obtain medicine for our children and that’s why we leave at night,” he said. “But medicine is expensive and we are forced to borrow money to help our children.” Mohammad fears that his children will not survive the winter. million internally displaced people (IDPs) in Afghanistan. 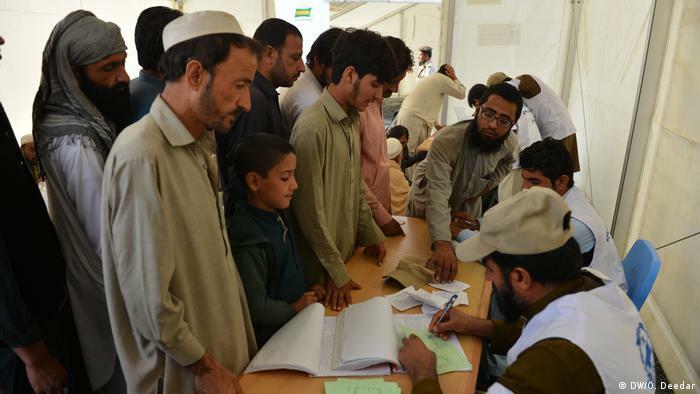 A report released Tuesday by the UN Office for the Coordination of Humanitarian Affairs in Afghanistan (OCHA), said that the number of registered IDPs has grown by 40,000 since mid-December and is expected to continue rising. The current refugee crisis is a direct result of the deteriorating security situation in Afghanistan, which is the worst it has been in years. Solving the crisis presents an enormous task for the country. There is fighting in almost every province – especially Kunduz, Uruzgan, Helmand and Nangarhar. Most refugees come from these areas. According to Danielle Moylan, a spokesperson for OCHA, numerous organizations work with the Afghan government to provide for refugee families that are often vulnerable in winter. “We want to be sure that despite the influx of refugees and internally displaced people, that we can guarantee access to adequate shelter, food, clean water, sanitary facilities, health facilities and protection,” Moylan told DW. But the current level of assistance does not seem to be enough. The aid organization Red Crescent Afghanistan said in a press conference that a humanitarian catastrophe was taking place. “Unfortunately, both international organizations and the Afghan government are unable to meet the demand for aid.” The Red Crescent added that although they prepared for the winter and for flooding in spring, the current crisis could not have been averted with their current level of resources. 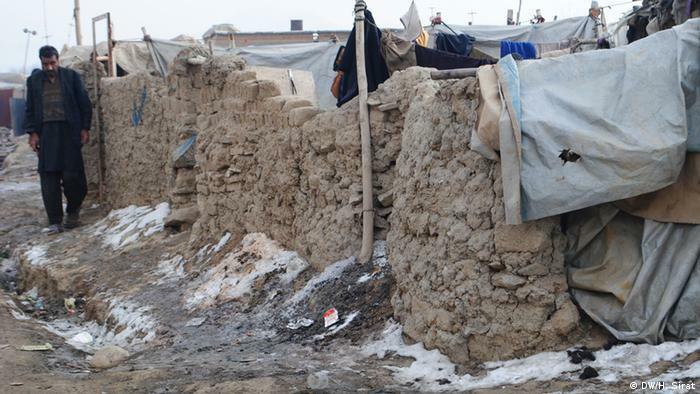 Most of Afghanistan’s internal refugees are lacking shelter to keep them warm in winter. Zia Rahman told DW that he and his family fled home from the so-called “Islamic State” (IS). “We received something to eat but we don’t have a tent or even a roof over our heads,” he said, adding that he did not want to return anytime soon. Even though fighting in his district has subsided, he is afraid that IS will return. For refugees in the eastern province of Nangarhar, the relatively mild temperatures spare them from the cold, but that is only a small consolation. The provincial government is becoming overwhelmed as the number of refugees here has been especially high in the past few months and continues to grow. The high number of Afghans returning from neighboring Pakistan is the main reason for this problem. OCHA estimates that in 2016, 500,000 Afghans were pressured to return to Afghanistan by the Pakistani government, which has said it wants all Afghans to leave the country by March 2017. Many of these people were born and raised in Pakistan and now they must move to an unknown country. Taher is 32 years old and returned voluntarily to Afghanistan. He told DW the government in Kabul has done nothing to improve the situation for people like him. “Our president, Ashraf Ghani, announced that every Afghan who returned home from Pakistan would receive gifts and land,” said Taher, adding that his expectations were not fulfillled. “Nothing of the sort has happened.” Taher works every day in a brick factory, earning a daily wage of six to seven euros. To start a new life, he will need much more than that. Ghulam Haider Faqirzai, head of the provincial refugee office in Nangarhar told DW that the Afghan government was working on a solution. “There is a settlement being planned for the refugees returning from Pakistan,” he said. “There should be sufficient shelter to house 30,000 families.” The number of those returning, however, is unfortunately much higher. The number of IDPs combined with those returning from Pakistan is nearly two million and this should increase as more arrive from Pakistan, Europe and Germany. Both the government and aid organizations will struggle to handle the situation and this has already become clear, as aid for IDPs in Afghanistan is currently sporadic and uncoordinated. Khayr Mohammad in Kabul can attest to this. “Today we will get a sack of flour from one aid organization and tomorrow another will bring us firewood,” he said. “But we aren’t animals that you can just throw something at. We are asking for a chance to educate our children. And we need a hospital.” As a father, Mohammad cares about his children and the winter is still long.